Is Hercule Poirot a serial false accuser? Hercule Poirot is met by an imperious woman who berates him, “How dare you send me such a letter?” Mrs. Sylvia Rule insists that she received a missive claiming she murdered Barnabas Pandy and advising her to confess. Threatening the perplexed Poirot with a lawsuit, she leaves in a huff. Minutes later, a rather disheveled man appears. “I got your letter accusing me of the murder of Barnabas Pandy.” The next day, two more strangers with letters both report that the old man fell asleep in his bath and drowned. Why did someone send accusing letters in Poirot’s name? If Pandy’s death was an accident, why charge foul play? 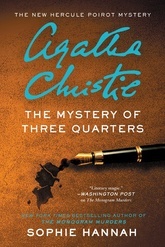 Engaging the help of Scotland Yard, Poirot untangles a web of relationships, scandalous secrets, and past misdeeds. Copyright © 2017 Bookspan. Doubleday Large Print ® is a registered trademark of Bookspan.